Gravity feed can storage in door, holds up to five 12 oz. cans. Slide-out shelves and door rack. 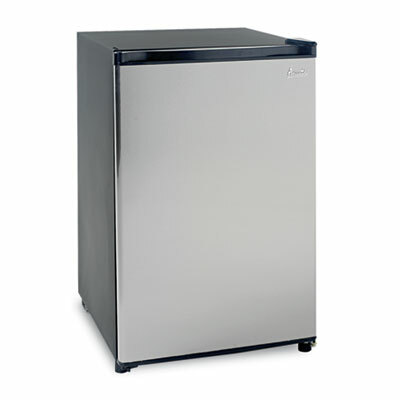 Sleek stainless steel design with 4.5 cubic feet capacity. Includes full-range thermostat, reversible door and full-width chiller compartment. Gravity feed can storage in door, holds up to five 12 oz. cans. Also features manual defrost option, slide-out shelves and door rack. Capacity (Volume) 4.500 cu. ft.